Families at Buckley AFB now have access to a new Department of Defense (DoD) website that simplifies and improves the child care request for care process. MilitaryChildCare.com provides a single online gateway for families to access military-operated or military-subsidized child care options worldwide across all Services. The site enables families to create a household profile, conduct child care searches, submit requests for care, and manage their requests at any time and from any location. 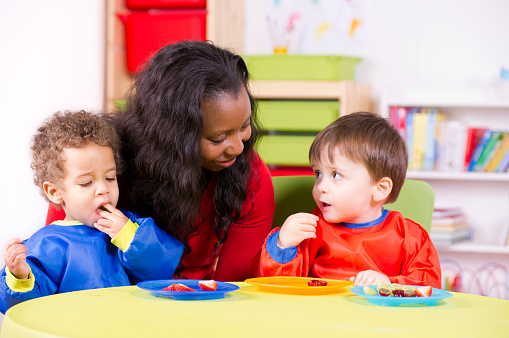 Our practices are based on current knowledge of early childhood development and education. We support the development of the whole child. * Our programs acknowledge children learn through active, hands-on involvement with their environment, peers, and caring adults. We respect each child's unique interests, experiences, abilities and needs. Children are valued as individuals, as well as part of a group. Our program respects and supports the ideals, cultures, and values of families. We advocate for children, families, and the early childhood profession. Full-time care is provided for children six weeks old to five years old Monday-Friday 0615-1745. 0615 - 1730 for children 6 weeks to 5 years on a space available, "first come, first served" basis. This is a convenient child care option for parents who just need a few hours to make an appointment or tend to other tasks. Cost is $4 per hour, meals and snacks are included. Please call 720-847-7215 or 720-847-6174 for additional information or for reservations. Buckley's Child Development Center offers a special time for parents to enjoy a "Parents' Night Out" one day every month. This popular child care program provides a break for parents while children are safely supervised in a fun and exciting environment. Families with children ages 6 weeks to 12 years may sign up on a space-available basis for $4/child per hour. The Give Parents A Break (GPAB) program is funded by the Air Force Aid Society and is designed to provide relief for active duty Air Force parents who are experiencing stress in their lives. This could be related to the military member being deployed or TDY, an emergency situation such illness of a family member, the family recently moving to the base, unique circumstances or hardships or having difficulties just being a parent. A referral certificate is required for participation in the program. Agencies who can refer families to the GPAB program include the Squadron Commander or First Sergeant, doctor or other medical professional, Family Support personnel, Life Skills personnel or a chaplain. 720-847-7215 or 720-847-6174 for reservations or more information. Would you like to open your own business? Become a Family Child Care Provider. The Buckley Family Child Care Program is currently recruiting child care providers to provide care for children with special needs and the Expanded Child Care Program which includes UTA/drill weekends. These individuals are given priority in licensing. If you are interested in becoming a licensed Family Child Care provider, please contact the Family Child Care Coordinator at 720-847-9225/7215. Our mission: "To provide secure, safe custody, promoting the health and well being of eligible children and youth, and to create an environment that fosters social, emotional, intellectual and physical development." The dedication and commitment in the leaders of this facility is unwavering. Program areas will encompass character & leadership, the arts, health & life skills, sports, fitness & recreation and education & career development. Current programming includes contracted karate classes, voice and piano lessons, teen and tween leadership clubs, art classes, cooking clubs, all night lock-ins & dances, homework help, babysitting certification, camping & ski trips and more. Our plethora of programming includes, Boys and Girls Club activities, 4H activities as well as special events and contract classes. Current and new members must complete their registration and submit a copy of a current immunization record with all up to date shots.